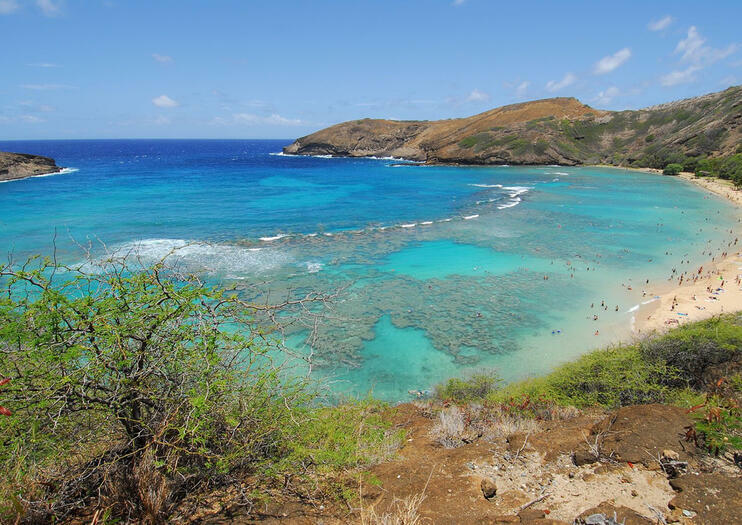 I went to Hanamua Bay to snorkle with the turtles. I hadn’t snorkled since I was a kid, and I hadn’t gone swimming for over 20 years, but hey—the body remembers. When you see the bay, you can not only appreciate that the water is a gorgeous blue-turquoise, but it is encircled by a half ring of hills. When you see it from above, it looks like two protecting arms around the bay. We were told to be very careful of swimming beyond that “U” shape; the tides can get pretty fierce out there (and there could be sharks). In the shallows, there are loads of coral reefs where fish and sea urchins like to visit. We were admonished to 1) only use “reef safe” sunscreen (the ingredients of regular sun screen has caused over time the death of many of Hawaii’s coral reefs), and 2) not to touch the turtles, fish or other sea life. Fair enough. Honestly, after all that beauty, I didn’t mind a bit about the turtles. It was enough to swim in the ocean and see the wonderous sealife there. Wow–what an adventure you’re creating!